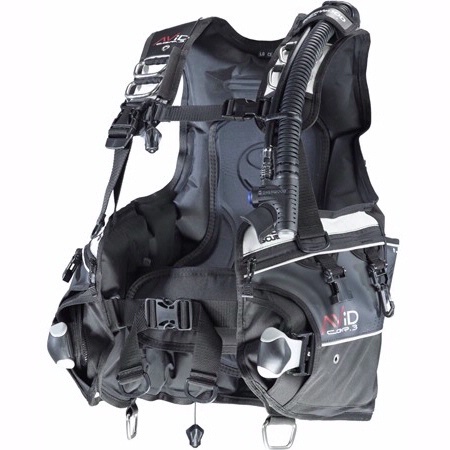 Avid features the 2 weight pocket system for a more secure, comfortable dive. 2 trim weight pockets hold up to 10 additional pounds. Jacket style wraps air completely around the diver for relaxed, secure floatation on the surface. A 3 dimensional aircell and suspension system provides a stable and secure fit eliminating squeeze when fully inflated. Easy oral and power inflation. Dual nylon tank straps with adjustable cam buckles thread through Sherwood's unique MiniPac tightly secure cylinder. Convenient utility pocket with velcro closure. Sized to carry a safety tube or folding snorkel. Ready for Akona BC Pro Kit and QuickClip. Two large zippered pockets. Six stainless steel D-rings. Exterior constructed of heavy-duty, 1000-denier urethane-backed nylon. Adjustable, depth compensating cummerbund and sternum strap keeps the fit snug. Right-shoulder vent valve.